I have been really pleased at the amount and the quality of produce that can be had from container gardening in a small courtyard in London. The protected nature of a back garden means that quite a few veggies have been ahead of more exposed spots. I grew these Rocket first early new potatoes in a bag. They are clean and prolific. The only slight down side is that because they were grown in compost rather than soil, the flavour was not that great. Perhaps next time I could mix some soil and manure. Masterpiece broad beans are about 5 foot tall and doing great too! Another taste test on the horizon. These are the Italian Romanesco courgettes. Supposed to be one of the best flavour. Traditionally bought in Italy with the flower kept on. Courgette flowers can be battered fried and eaten too. I am going to do a taste comparison test with my old favourite Black Forest climbing courgettes. A climbing courgette is a real bonus in a space saving container garden. I'll let you know how the taste test went. Hello everyone! 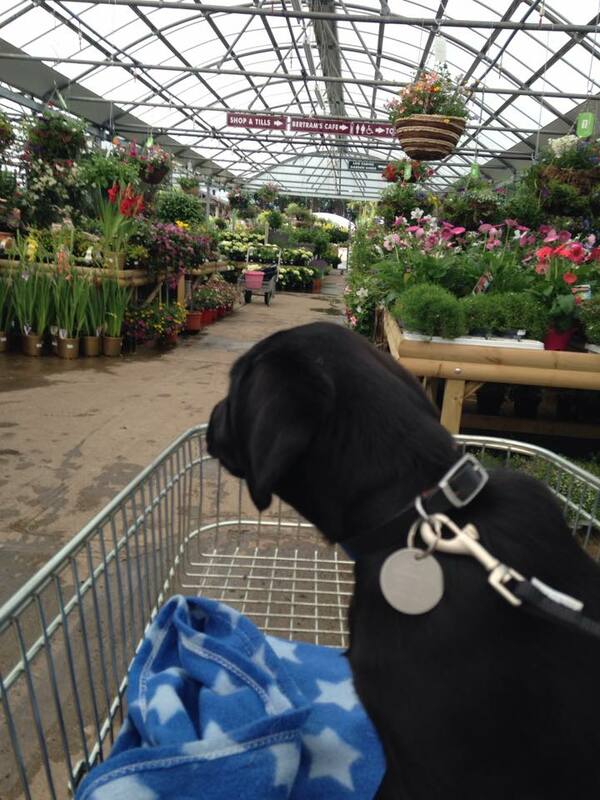 Matron has now filled the vacant position of 'Assistant Gardener'. The job goes to 8 week old Daisy the Labrador. 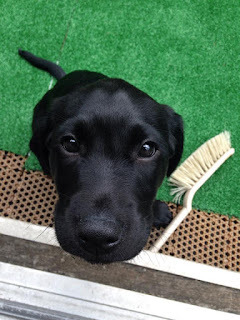 So far she has been keeping me on my toes picking up leaves, sticks, moss, and generally helping around the garden. She also picked a ripe strawberry yesterday when she came home, but this innocent little face denied all knowledge of the deed! 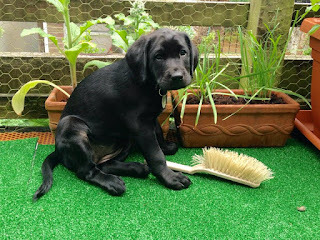 So what is the first task for an Assistant Gardener? 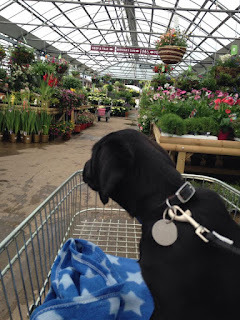 - A trip to the local garden centre of course! I am so happy with my new container veggie garden. My South facing London courtyard garden has been coming on leaps and bounds. I think the sheltered nature of it means that these courgettes are fairly well ahead of most others. This one above is a Romanesco Courgette from Seeds of Italy. This climbing Black Forest courgette is a great way to save space in a small garden, they will climb up a trellis! I have interplanted them with Blauhilde climbing French beans. The beans will climb up the climbing courgette which will climb up the trellis! I can't believe the size of my broad beans either! These are just Masterpiece broad beans but they are 5 foot tall already! This is the South facing wall, so I am growing most veggies here. Also very pleased with the plastic potato planters. I have been earthing them up gradually to the top of the container and keeping them well watered. Time is coming now, I think, for a little peek. The Rocket new potatoes should be just about ready. I bought some grow bags and some metal plant supports for the tomatoes here. I can tie all the canes together for additional support. Lots of sunlight here in the middle of the garden so they should do OK if I can keep them well watered. and I didn't think my rhubarb would do as well as it has done in the first year after lifting and dividing crowns from my old allotment. I suppose they might have needed dividing, and I did give them a lovely bed of rotted manure here. This is a West facing wall so it gets mid day and afternoon sunlight. Right next door to the rhubarb on this South West corner is my Tayberry. I transplanted this one from my old allotment too. A Tayberry is a cross between a raspberry and a blackberry. Lots of flowers and fruit forming here, the bees are loving it.